This weekend has thus far been spent making the things we've run out of. Yesterday morning I made a batch of yogurt, half a gallon this time rather than a full gallon, and it was ready when I got home from work. Last night I started a batch of bread. This morning I proofed it and baked it. This afternoon I made eggplant caponata and canned it (three pints plus one 4-oz jar). Later today I'll make granola. 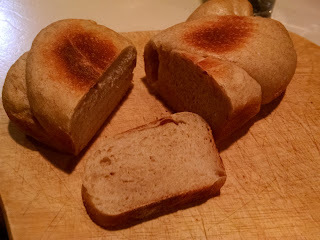 For the bread, I thought I'd try to make a Pullman type loaf using my regular loaf pans and a baking sheet to serve as a cover. They worked okay, but could have been proofed longer so they would have been more square. I think if I'm going to do this on a regular basis I would need a Pullman pan with a lid and use a less dense bread dough. Also, two days ago the youngerchild and I made a batch of cookies. For the first half, it was just regular chocolate chip cookies with both milk and white chocolate chips. For the second half of the batch, the youngerchild requested to add mini-marshmallows. They don't exactly work as desired; the marshmallow melts and leaves holes in the cookies. I suspected that might happen which is why I didn't add them to the whole batch. I did, however, solve the too-flat problem; my oven hasn't been hot enough so they would spread too much and get very flat.